Not up yet, Amy? I assume you've been invited to stay in the mansion in the 19th century. Looks like you get to sleep in. Wakey, wakey!!! I'm dying to see what it's like in there. There's a shower in the bathroom of the mansion? Definitely upper class, I'd say. Oh, yeah. There's like waay more than one bathroom on this floor where the bedrooms are... pretty much all with the same kind of showers. 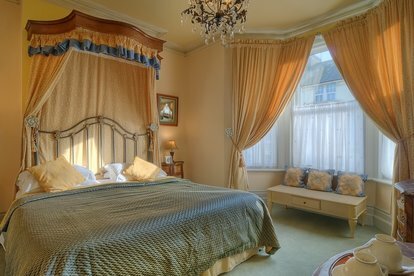 No one's staying in the other bedrooms right now though - I know cause I went snooping. But Charlotte says they're expecting guests any minute. It's pretty awesome here. Check out my bedroom. Charlotte said I can stay in it for as long as I want. Tomorrow she's taking me on a whole tour of this place. She says there's secret doors that lead to tunnels and everything. And she seems so happy. She's always smiling. I swear even her missing fingers don't matter to George. She hasn't put on her gloves once in the house since I've been here, or tried to hide her hand. I'm definitely happy for her, Amy. And for you. Just don't mess this chance up. You may never get a better one. Remember - you're expected to act like a lady in the 19th century, especially in front of the guests that are arriving shortly. It wasn't until the early 19th century when washing the entire body was considered good for one's health. The first shower was invented in 1767 by William Feetham. It was a domestic servant's duty to pour the water into the lower basin, where it would then be forced up to the upper basin by means of a hand pump. Only cold water was used, and the same water would be pumped over and over again until the occupant of the shower felt himself or herself cleansed, or sufficiently over-chilled. In the middle of the 19th century, when you currently exist, warm water is beginning to be introduced into bathrooms, improving the overall effect and pleasure of having a shower. By the late 1800s, the middle class will start to see warm water in their homes, as plumbing improves and pipes and faucets become readily available. It will still be considered unhealthy to be too clean, though. Having a shower every day, as we do today, will be discouraged, and the normal ritual of cleansing from a washstand in the bedroom will temporarily remain fashionable. 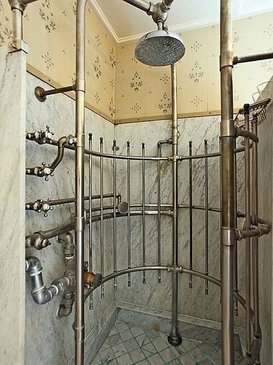 In the 1920s, showers will become a normal fixture in everyone's home.